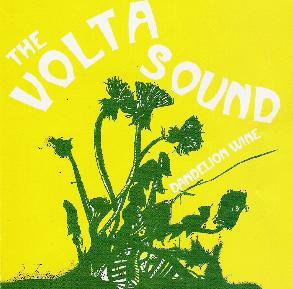 The Volta Sound - "Dandelion Wine"
With folksy, strumming acoustic guitars; punchy horns; electric piano and organ; hand claps; shaker percussion; swirling flute; dreamy, sleepy-eyed vocals, summery melodies and four-part, sing song harmonies, The Volta Sound bring to life the golden age of sunshine pop in the here and now. You just can't help smiling, tapping your toe, and nodding your head to this music. Blend the slightly edgier sound of Loaded-era Velvet Underground with the happy-go-lucky folk-pop of The Lovin' Spoonful and you'll get an idea of what The Volta Sound is all about. But wait, it doesn't stop there! The Volta Sound aren't afraid to experiment a little either, and they do so in fine form on the 10-minute long Faustrock, a hypnotic Krautrock-style freakout with eerie atmospherics, throbbing rhythms, and trippy organ and electronics. Yet, as odd as that may sound, it still somehow manages to fit with the flow of the rest of the music on the album, adding a lovely psychedelic touch to the proceedings. Other highlights include the campfire sing along of I Love You, the rhythmically groovy Girls and Tambourines, and the almost Led Zeppelin-esque Goldilocks, not to mention two trippy, experimental, and bluesy untitled bonus tracks. There's no question that Dandelion Wine is pure listening pleasure that will bring a little sunshine into even your most dreary of days. For more information you can visit The Volta Sound web site at: http://www.thevoltasound.com. Visit the Orange Sky Records web site at: http://www.dionysusrecords.com/orangesky. Contact via snail mail c/o Orange Sky Records; PO Box 1975; Burbank, CA 91507.